1) The singer says that he noticed the lady in question as soon as she walked into the room. Tell us about someone who made a powerful first impression on you. Maybe when I met Stan Musial #6. I was star struck...he is a Hall of Fame baseball player for the St. Louis Cardinals in case you have never heard of him. 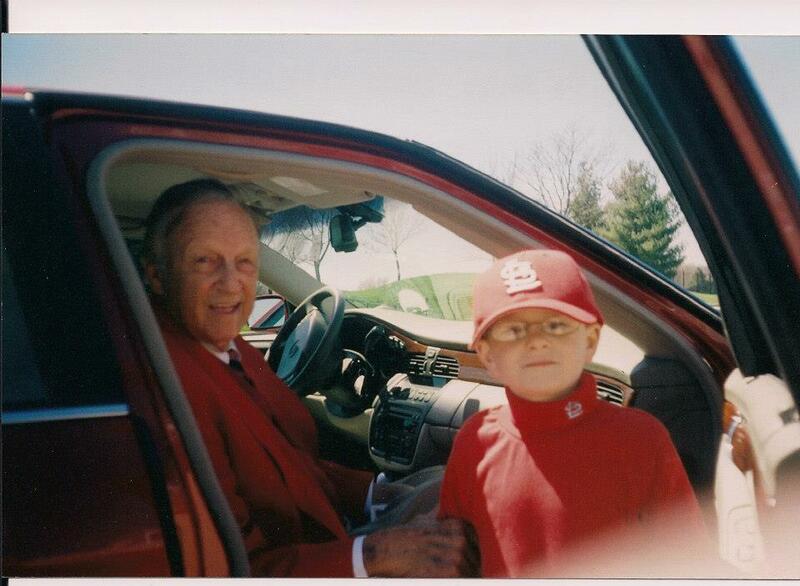 Here is a picture of the day I met him, he is with my son Josh here. 2) He sings that he's so into her, he can't think about other, more mundane things. Do you find you get easily distracted from your daily tasks? Or do you enjoy seeing your everyday chores through completion? I try to see my tasks through, but sometimes I can be easily distracted. I start thinking of other things I need to do and the next thing I know, I have several projects going. I always see them through though. 3) The band took their name from Georgia's biggest city. Have you ever been to Atlanta? I have driven through Atlanta on my way to Florida. 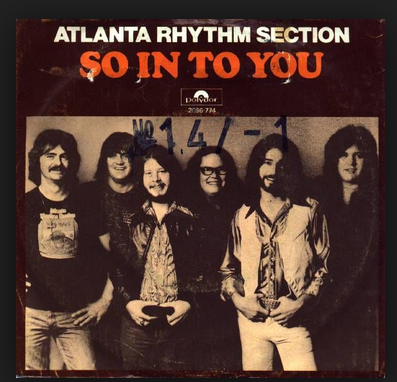 4) The Atlanta Rhythm Section once played the White House. President Carter's son, Chip, was a big fan and invited them to play at his 28th birthday party. How did you celebrate your last birthday? My co-workers threw a party for me and showered me with gifts. We do this with all of our co-workers so our birthdays are special. My husband got me Chinese for dinner, which is a favorite. 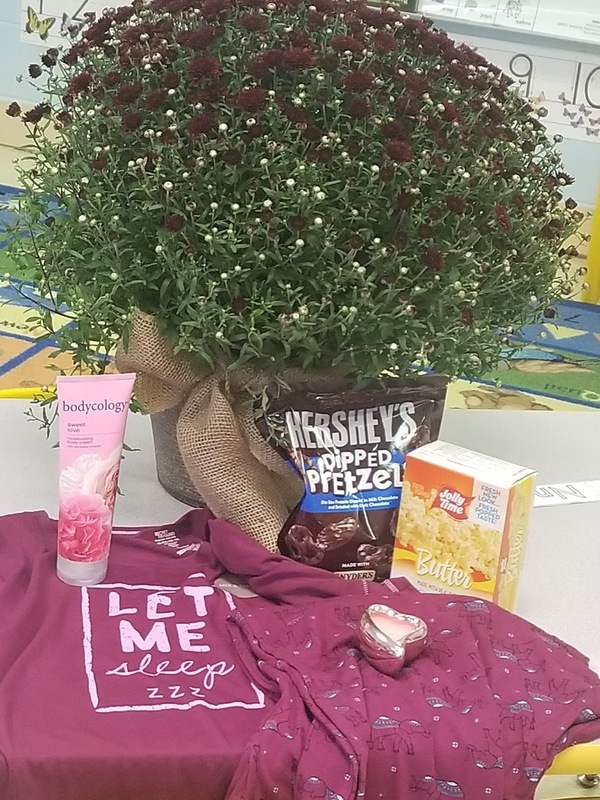 Here is a picture of my gifts from my co-workers...a giant mum, which is gorgeous! Pajamas, lotion, chocolate pretzels, popcorn and a candle. Loved it! 5) Studio One, where the band made all their recordings, was torn down and replaced by a parking lot. Can you think of a structure that you missed, after it met with a wrecking ball? no, not really...but I sure do miss the twin towers since 9/11/2001...not that I ever saw them in person, but on tv, they were so beautiful. Stan the Man! I've never heard a bad thing about him ... and that's saying something, since I'm a Cub fan. Your coworkers really came through with those birthday gifts! I always misspell cemetery too. I want to spell it cemetary. Thanks for visiting my blog today! I enjoyed your Saturday 9 answers!! The Cars are on my expanded list of groups I want to see in concert. Their music was huge when I was in college. New York's skyline is certainly different without the Twin Towers. I had friends who had a Christian rock band at the time and they had just put out their first CD right before 9-11 happened. The lead single on it was called "My God's Bigger Than That." The photo used to illustrate it on the CD was one taken on their visit to NY in 2000. It showed the 4 of them standing around and looking down on...the Twin Towers! That sure was a "whoa..." kind of moment realizing it. I have never worked a place where they celebrated my birthday! Lucky you. I forgot about Michael Jackson. That was startling, wasn't it.